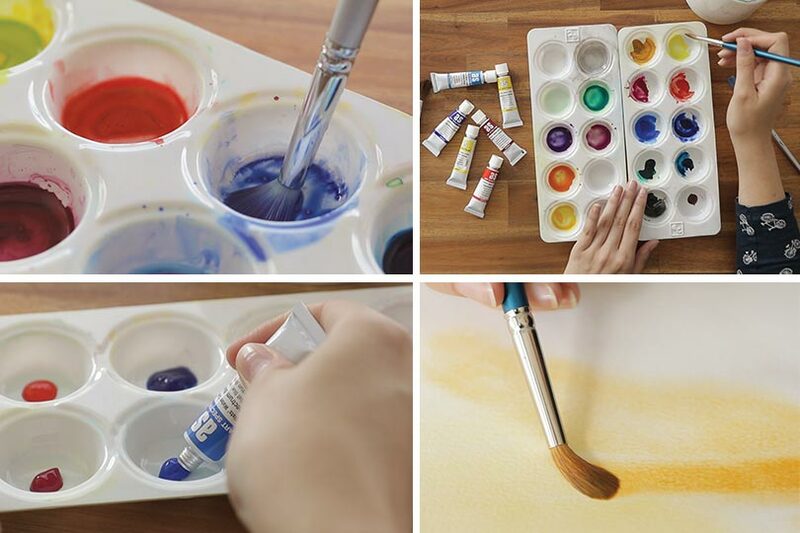 Watercolour paint is applied with a brush onto paper and remains soluble to water and permeable to touch over time. It’s more transparent and thinner compared with other water-based paints such as gouache and acrylic. Opacity naturally varies across colours. The pigment’s natural properties determine whether the paint is transparent, semi-transparent or opaque. Transparent colours are often used for glazing and allow the light to transfer through the paint and reflect off the paper, which improves colour vibrancy. Some colours have greater pigment strength, so less paint is required on the brush, especially when mixing colours. E.g., mixing a mid-orange requires less red than yellow. 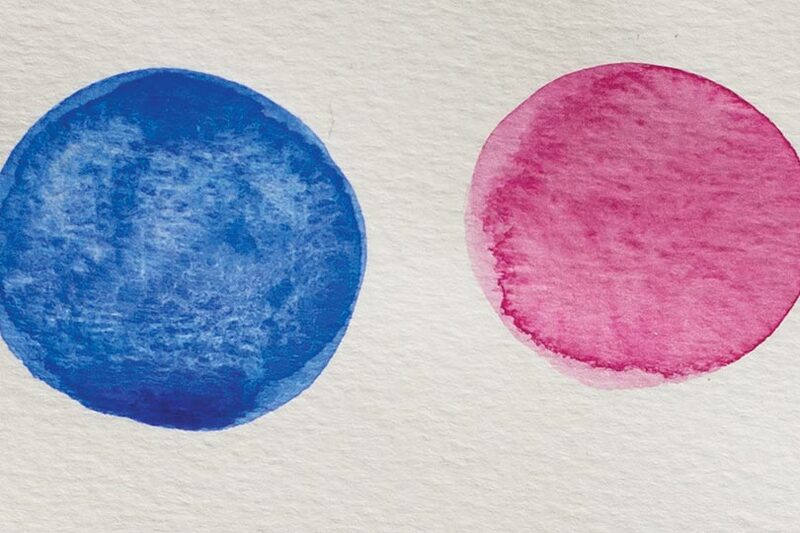 Staining pigments are difficult to lift off the paper, whereas nonstaining pigments can be more easily removed by re-wetting the paper and lifting the colour off. 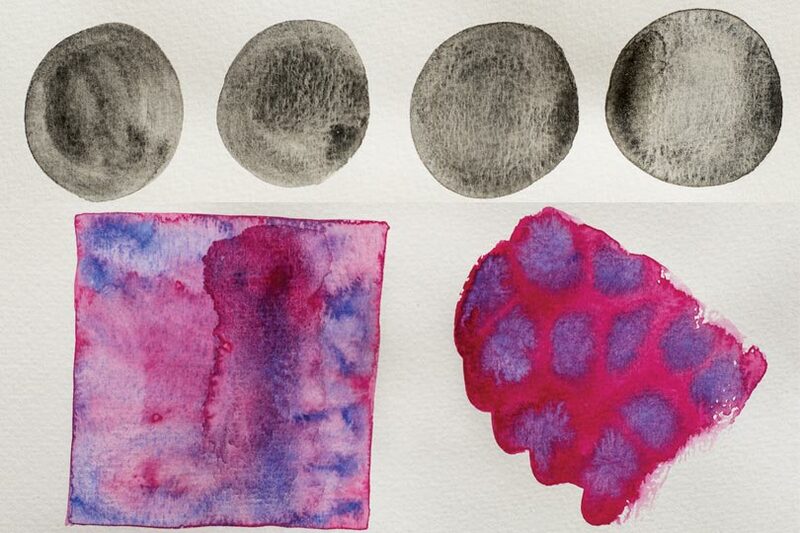 As watercolours are made from ground up pigment, they react to water and the paper surface in unique ways. Non-granulating pigments react smoothly and evenly with water and provide uniform coverage with little variation in texture. Ideal for rendering solid man-made surfaces. The more water used, the more intense the granulation effect. 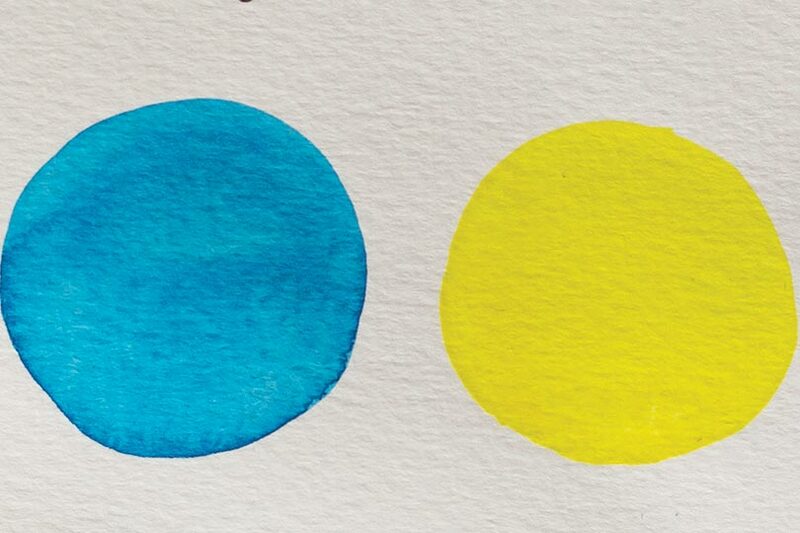 This granulating tendency creates interesting effects when colours are mixed. What’s the Difference Between Artist or Student Quality? 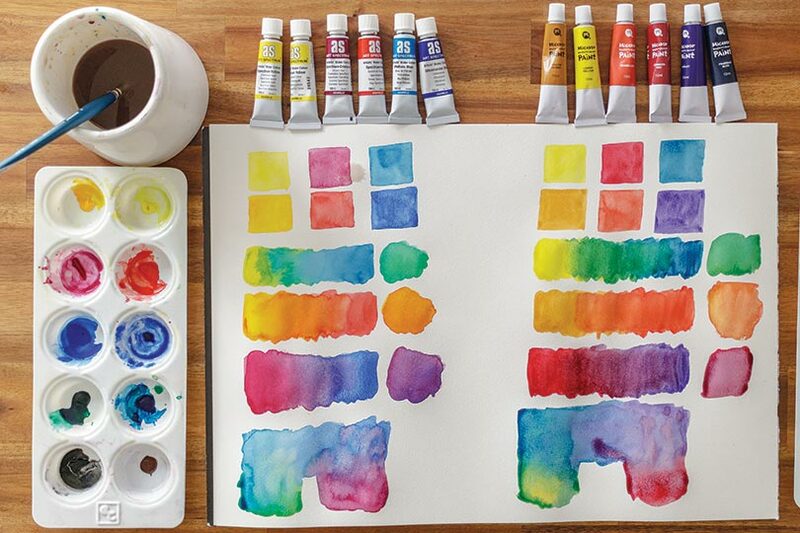 Artist Watercolours: Made from pure and quality pigments with high permanence and vibrancy. Very high pigment content in paint formula, which provides clean colour mixes and strong tints. Colours are often rated for permanence and lightfastness. Priced higher than student quality paints. 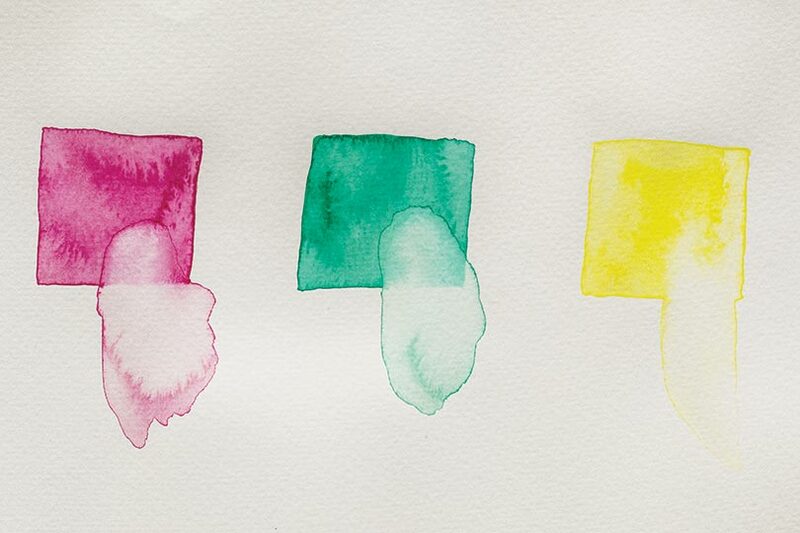 Student Watercolours: Consist of modern, man-made, non-toxic pigments, which vary in lightfastness. Pigments are not as pure or saturated as artist quality, which can affect their ability to mix cleanly and deliver (or retain) vibrancy. Typically, student paints are made using more binder and less pigment, which results in a chalky, opaque finish. Limited colour palette. 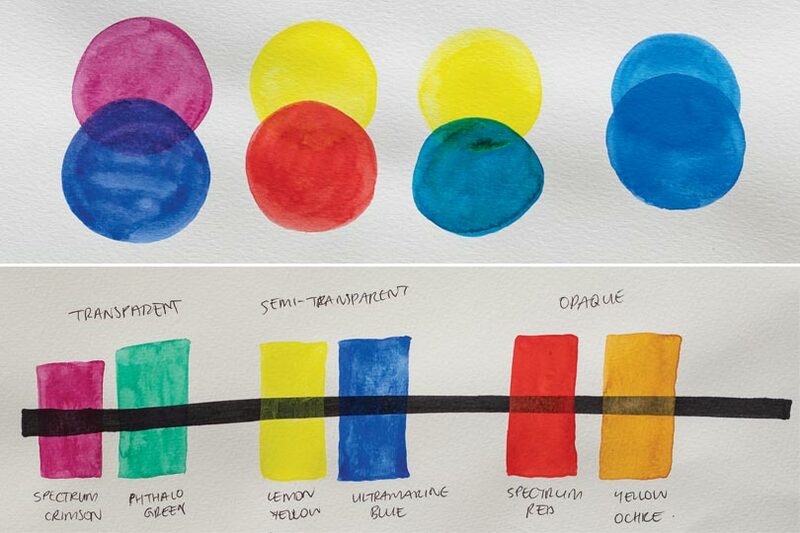 What About the Difference Between Watercolour Tubes & Pans? Pigments are ground and stone-milled together with water and a binder called Gum Arabic, which enables the pigment to sit on the paper surface. This mixture is then either transferred into paint tubes at the consistency of toothpaste or poured directly into paint trays to form hard discs. • Can be used straight from the tube without adding any additional water to achieve maximum colour intensity and coverage. • Ideal for mixing large batches of paint. • Preparation and pack up time is required for squeezing out paints and cleaning palettes. • Often there is paint wastage as it can be difficult to determine how much you need. Some pigments left to dry on the palette can be reworked but can be difficult as paint loses its colour intensity and may appear grainy. • Tubes are less convenient to transport. • If caps are not replaced correctly, they will get stuck and paints will dry out. • Often colour mixing is required. • Pans are dry and firm blocks of colour. • Compact, portable, durable and easy to store. • No preparation time required. • Minimal mess and less wastage – only use what you need then leave to dry and ready for next use. • Tends to last longer in the artroom, making them less expensive than tubes. • More difficult to mix large volumes of paint, especially if thick mixes are required. • Pans are rougher on the brush bristles, which may shorten the brush life. • Easier to share in group settings such as the artroom. 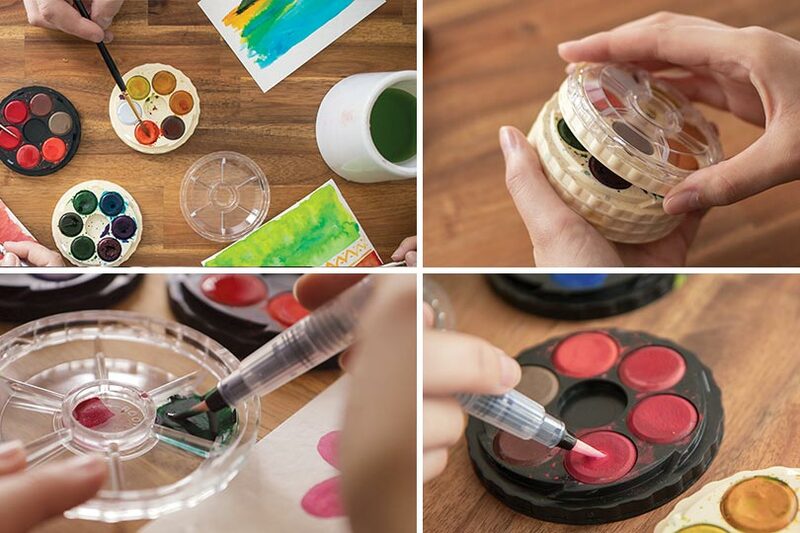 • Lid acts as a mixing palette, which can easily be wiped clean with a wet cloth. • Easier to see all the colours on working palette. • Colours can be lightly sprayed with water before use to improve workability. • Wider selection of nuanced colours, which are ready to use. Not as ideal for pure colour mixing as colours are created from multiple pigments. • Possible to pick up a lot of colour for highly saturated coverage, or to dilute the colours by picking up a small amount of colour on a wet brush.